Be alive – Stop being a Resume! Stop being a resume. Be a person. Be alive. Live! I met a friend who was between jobs. He asked me to take a look at his resume. And wanted to know how much I would offer someone like him__with his qualifications, his achievements, his profile__as an annual remuneration package, if I was a decision-making recruiter in his industry. I dodged his question citing lack of competence and knowledge. His keenness to check out his worth amused me though. Why are we so obsessed with our price tag in the job market? Isn’t is high time we understood that features, benefits, value-for-money pitches are for things. People cannot be evaluated the way things are. A doctor is worth as much as the lives he saves and not by the money he makes. A singer is valuable because she makes her listeners’ hearts sing and not because she is “always in the news” __ Shamshad Begum who passed away earlier this week is a case in point. A car mechanic is brilliant when he can fix your car’s engine efficiently and not because he works for a big, multinational automobile brand. In a way, we have all become victims of a society that values our utility more than our real selves! A carpenter, an electrician, a doctor, a lawyer, a writer, an actor __ all these are professionals offering a service, a certain utility. But is this who the person is? Is the person who does carpentry only a carpenter? Isn’t there more to a doctor’s persona? Somewhere, in trying to become successful professionals, all of us have got wedded to our utility value, our usefulness to and in society, and so have started identifying ourselves with our resumes. 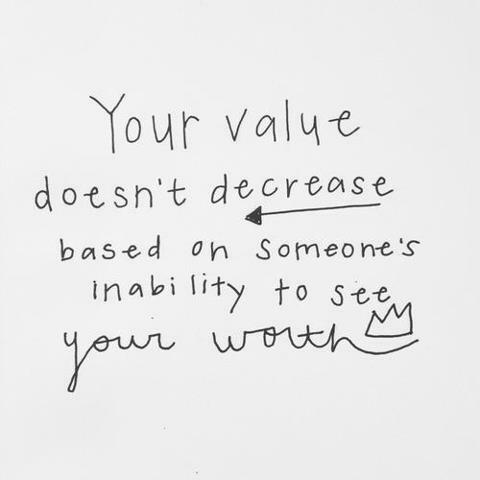 We have stopped looking at our self worth! The identification with the material side of our lives has become so strong, so rigid that we are only driven by our desire to command higher price tags in the job markets. Earning a living has become an obsession. Living has become an after-thought, a virtual impossibility in this title-obsessed, perk-obsessed, bank balance obsessed world! If you ask yourself who you really are and what you really love doing, you will start living! Living for yourself doesn’t mean at all that you must be selfless and insensitive. This only means you learn to do what makes YOU happy. This means don’t sacrifice your inner joy for the sake of labels, expectations, opinions and conditions that people around you impose upon you. Nothing wrong with it if what you are doing gives you joy and serves society as well. But many a time, people are caught in the web of earning more at the cost of their own joy! This is the cause of all their grief and suffering. Look for inspiration from nature. A flower flowers. Birds chirp. Rain falls. Rainbows appear. All these and more are happening not because they are being judged or demanded or paid for to do so. They just do it for their own joy! In the process they bring us, observers, alive. They enthuse and energize us. But they don’t let our opinions, judgments or valuations pin them down. They keep on flowering, chirping, falling and appearing. Things are for using. People are for simply being. Things have a price. People are priceless. Don’t bother about what value you have in the job market! Simply do what gives you joy. Bliss and earnings will follow __ in that order! Author AVIS ViswanathanPosted on April 27, 2013 March 14, 2016 Categories Art of Living, http://schemas.google.com/blogger/2008/kind#post, Inner Peace, Intelligent Living, Job Market, Resume, Self-Worth, Value2 Comments on Be alive – Stop being a Resume!